As with many other generative approaches to interactive storytelling, the stories that can be experienced or told with The Virtual Storyteller are part human-authored, part system-determined. In particular if stories are to emerge, it is impossible to determine beforehand what content and processes to write in order to come up with a satisfactory story domain. Rather, we conceive of the creation process in The Virtual Storyteller as a continuous cycle of writing content, seeing what the system makes of this content, and coming up with new ideas. 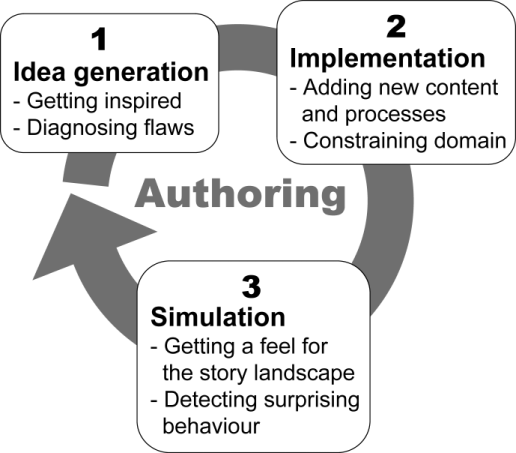 An authoring paradigma that has proven useful is to not only correct the system if it is not doing what was expected (’debugging’), but also to accept that the system may take the space of potential stories in directions not initially considered (’co-creation’) . In this process, it is considered important to maintain a tight feedback loop between the steps, making small, incremental changes to the content. Furthermore, it is considered important to actively consider whether certain content can be reused in other situatons. This helps create density of the space of stories. Events What can happen (unintentionally, e.g., a car accident or dropping a vase), under which circumstances is this possible? This knowledge is currently created as a combination of RDF/Turtle syntax (setting), RDF/OWL knowledge edited in the Protégé tool (ontology) and Prolog files (goals, actions, etc). Eventually we would like to have a tool that supports authoring, for instance by presenting pre-defined fields, checking syntax and semantics, providing visual organisation of the content, and checking interrelatedness of content (e.g. actions that can be strung together in a plan but also, e.g., finding goals that can never occur). rdfs:label "Little Red Riding Hood" . rdfs:label "the path leading to the forest" . This entry was posted on Sunday, November 15th, 2009 at 22:13	and is filed under VirtualStoryteller. You can follow any responses to this entry through the RSS 2.0 feed. You can leave a response, or trackback from your own site.